Long and middle distance runners were undoubtedly among the very the first athletes to use apps on mobile phones as training and racing performance enhancing and training tools. Many used them as upgrades from the fancy running watches and other devices they had been using. 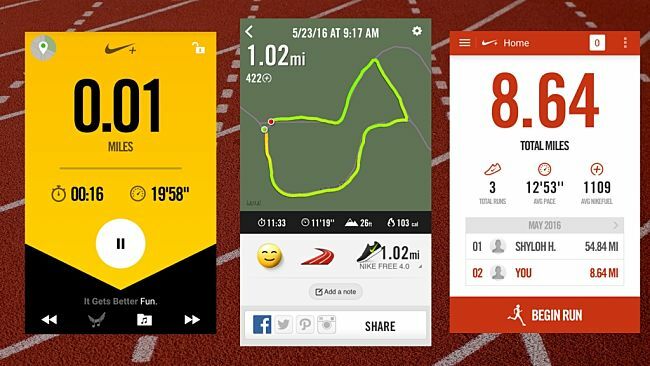 Some of the best known apps are Endomondo Sports Tracker Pro ($4 on Apple and Android, with free limited versions), Runmeter GPS ($3 on Apple) and MapMyRun+ (free on Android; $2 cost on the Apple, as iMapMyRun+). 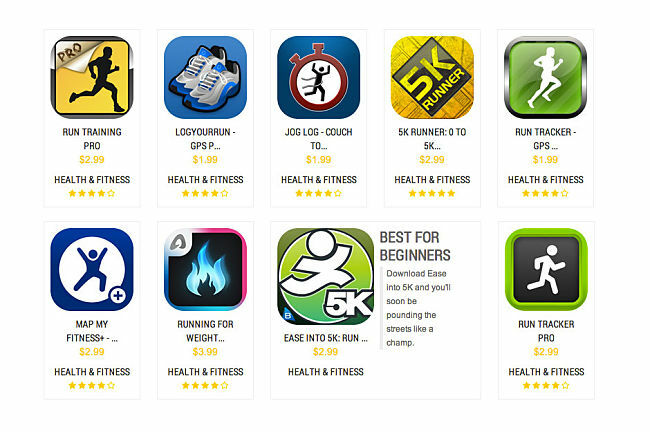 The apps have been very popular with the runners themselves and also for coaches to provide speed and performance records right through a race of training run. 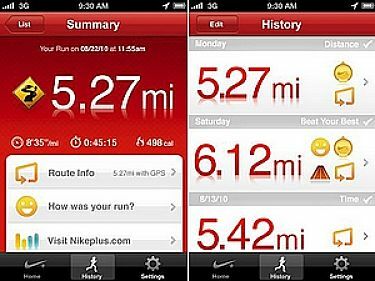 These apps also allow runners to link to various websites with information about routes and time records for various runs. This information can be shared and allow live communication between runners. The sports goods manufacturers such as Nike and Adidas, as well as Google and various independent software companies have been involved in strong competition which has driven innovation to new heights. However the apps also allow walkers, runners and cyclists to store and download information about their workouts from various devices that have an Internet connection. These data about routes and training programs can be shared and monitored, and analysed by a coach. In some ways these apps have superseded the smart watches and various dedicated running and training devices, some of which have been built into shoes. Many runners still like watches because they are so portable and convenient and have many powerful features including the ability to download data to a PC. The new Sportive training watch from French company VEA includes such features as a pulse rate monitor, MP3 player, basic mobile phone, time functions, camera, a 1.5-inch touchscreen, 8GB of storage, Bluetooth connectivity, and an SOS button that combines with a tracker feature, to email your location to someone if you need help. People who want a free simple app to lead them through a workout or training run should look at miCoach (Apple and Android). miCoach uses GPS, ha a heart rate monitor and can provide real-time voice coaching in your ear to help you keep to your pace during your run. Various training plans are available for various speed and endurance combinations. You can record, track and share your training with your coach or friends at miCoach.com. Experienced runners who need less coaching may like MapMyRun (Apple or Android) that has more nutrition-related features. You can record your workout data, including duration, time, distance travelled, elevation, calories burned, pace, speed and route (via GPS) on an interactive map. Workout data can be easily save and uploaded. One quibble is that the interface lacks the spark of its competitors. All the core components are there including new social contact elements similar to those of Endomondo. Unique to MapMyRun is its nutrition center where you can log weight, meals, food and water consumed, and track your net calorie consumption and burnt through exercise. And unlike Runmeter and Endomondo, MapMyRun lets you control your music from within the app. 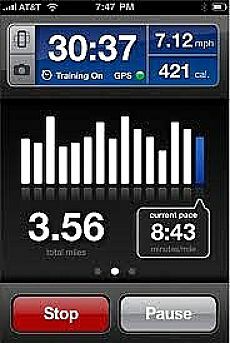 iPhone owners should look at Runmeter GPS ($3), which integrates the coaching functionality of miCoach with social interface functions of Endomondo in a simple and easy to use package. For a free but comprehensive apps, miCoach is a good choice. You can go for a ride, walk, jog or run and the app will monitor your progress. There are many packaged workouts of various levels available, all of which have an automated coach to monitor you. These workouts are excellent for people who run or walk on treadmills. Endomondo, MapMyRun and miCoach sends data to personalized Web pages where you can see all your training plans, record or performance and get lots of tips and see the your friend's workout data. miCoach is slightly less functional than they others. Endomondo (Apple or Android) has more social networking elements and less coaching options. Endomondo Pro has a newsfeed feature that allows friends to monitor your workouts, in real time, and even send messages that are broadcast to you as you run. 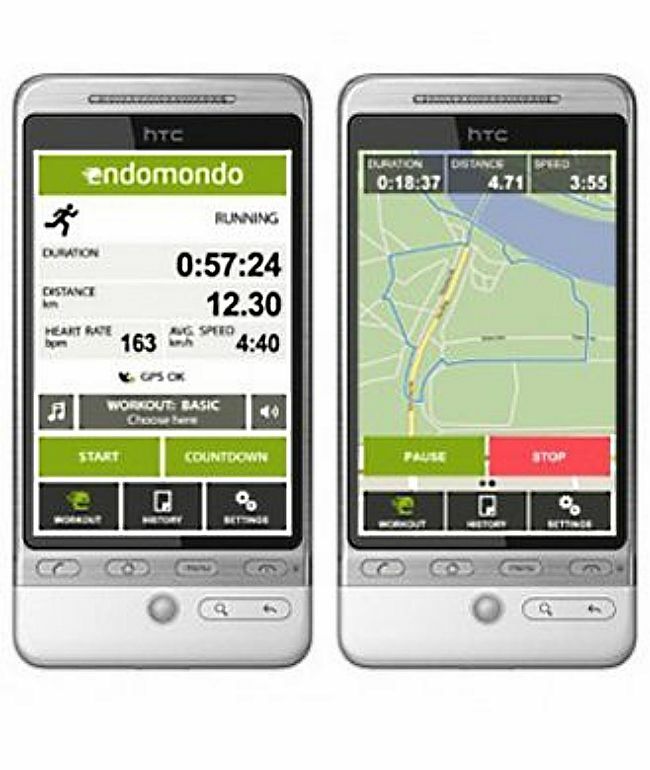 Endomondo has many sophisticated features that will appeal to serious distance-training athletes. You can establish both time-related or calorie-related goals before you start on a run or ride, and the app will provide audio updates during the training workout. At the end of the exercise period you can download and view lots of data such as split times, maximum speed, average speed, altitude and elevation climbed all from within the app. You can upload the data and review more comprehensive data on your Endomondo.com page. Endomondo has a nice and clean interface, despite its sophistication with large, thumb-friendly buttons that an athlete can easily find and operate. Runmeter GPS does no have a dedicated Web site where you can store analyse and review workout data, but you can to email data to external destination. For example you can export your data directly to Dailymile.com, which is a social media site for sharing and tracking workouts data. The app also includes many coaching features similar to the other apps, including audio coaching messages. You can even download various voices if you don't like the standard on that comes with the app. One of the outstanding features of the Web sites linked to many of these apps is that you can see routes suggested by others and various reviews and comments about them. However it pays to check the details. For example, Endomondo’s route maps omit elevation, so you can’t look for routes with tags such as 'flat', 'elevated' or 'hills'. MapMyRun’s Website allows you to 'tick off' routes that you have run and highlight other routes that you would like to run. 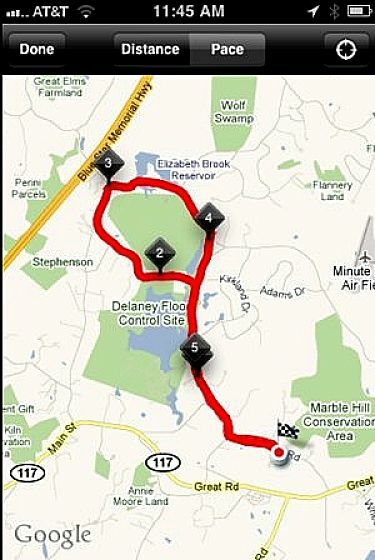 Over all, the MapMyRun’s website is better than many of the competitors. 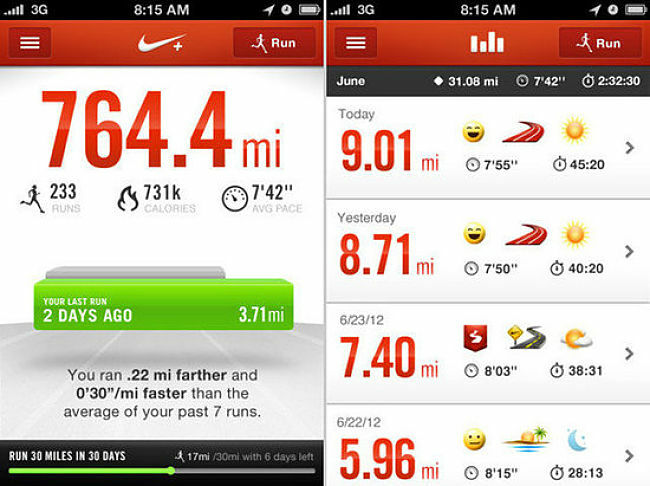 Nike and other Sporting Goods suppliers have also developed their own apps.